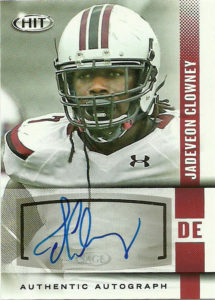 While opening up this completely uninspiring box of Sage 2014, I got to the last pack of cards and pulled this gem in Jadeveon Clowney. After the Texans monumental collapse in 2013 that resulted with the unceremonious termination of Gary Kubiak‘s staff, Houston had a new sheriff in town with Bill O’Brien. To make up for the additional dismissal of popular defensive coordinator Wade Philips, the Texans got Romeo Crennel- a mastermind in his own right. It was clearcut that Clowney was the most imposing and physical player in the 2014 draft by far, but no team was willing to pay the lion’s share in order to pry him from the Texans. So Houston did the most logical thing and drafted Clowney with the first overall pick to be a part of their already stout defense. At 6’5″, 266, Clowney ran an eye popping 4.53 40, and dominated the combine as the leader at his position in the broad jump and vertical jump. Clowney is tremendously quick and is known for his high motor pursuit sideline to sideline. The Texans plan was to shift Clowney to the pass rushing linebacker position in their 3-4 alignment. Jadeveon displayed some of those tantalizing abilities during the preseason but had to have micro fracture knee surgery ending his rookie campaign. He finished 2014 with 7 total tackles (3 STF). It was pretty rough for Clowney. A lot of people just wanted him to fail. The ‘bust’ label was thrown around a lot, but hand it to Jadeveon for ignoring and fighting through it. 2015 was more like his rookie season and in 9 starts he had 4.5 sacks, 27 tackles (5 STF), a forced fumble, and 6 passes defended. So when you think about it, Clowney’s 2015 was a solid debut. With JJ Watt out for the 2016 season, the Texans had to rely on Clowney as the big dog on the defensive side of the ball. Crennel shifted Jadeveon back to his natural position of defensive end and he responded by leading the defense to a #1 overall ranking. He put up a solid line of 40 tackles (12 STF), 6 sacks, 2 passes defended, and a forced fumble. During the playoffs Clowney was moved back to linebacker and with a new bag of finesse moves from a standing position he wrecked the Raiders game plan, coming up with numerous pressures and an interception early in the game deep in Raider territory. (The play was reminiscent of JJ Watt’s coming of age during his rookie season against the Bengals in the playoffs.) After the season, Clowney was the only player on the Texans defense to earn a Pro Bowl berth. Texans fans were eager to see Watt and Clowney at full speed for 2017 but the Texans got bit by the injury bug in a bad way- as the team lost both Watt and Whitney Mercilus during the same game. Clowney however turned it up a notch. In fact he came to play especially in big games. With 3 games to go in the 2017 season, Clowney already has a career high 9 sacks. A true game wrecker, Jadeveon also returned a Tom Brady fumble for a touchdown.